HOSPITALS AND CLINICS Good medical facilties do exist in Bolivia, but the quality of the services they provide and the availability of essential medical technology vary greatly. For the most part, avoid state-run hospitals and clinics as they usually have only the minimum necessary medical equipment and often run short medications and vaccinations. Waiting times are extremely long. Ambulance service is minimal in Bolivia as well. The following are the best hospitals and clinics in Santa Cruz. I’ve actually used each and every one of these at some point for various reasons, so below each I’ve added my impression of the quality and services. 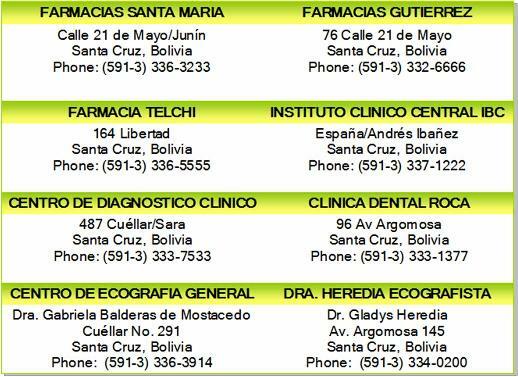 The US Embassy in La Paz provides this additional list of medical resources in Cochabamba, La Paz and Santa Cruz. HOSPITAL URBARI is modern and clean, the staff are courteous, knowledgeable and very attentive, and the doctors are excellent. Medical instruments and technology are very adequate. Minimal waiting times, even in emergencies. Probably the best hospital in Santa Cruz. HOSPITAL UNIVERSITARIO JAPONES is operated with funds donated by Japan, thus its name. Medical technology is good. Personnel could have better bed-side manner, but doctors are excellent. Provides emergency services for the general population and waiting times are usually very long. 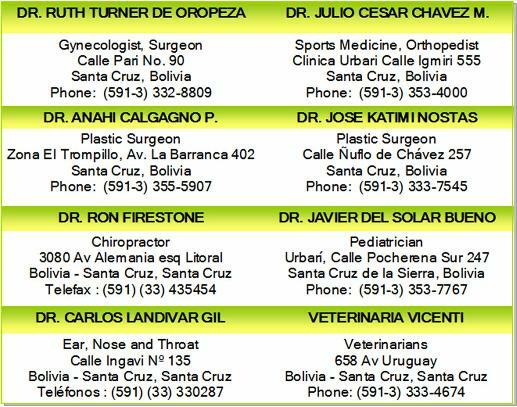 CLINICA ANGEL FOIANINI is considered the very best clinic in Santa Cruz, it is also just about the most expensive, but doctors are top-notch. It is small, but really well operated, and is pretty much a hospital. Waiting times are minimal, even in emergencies. CLINICA MEDICA SIRANI is a medium-sized clinic in the downtown area. It is not as modern as others, but it is well-run, organized, clean, and the staff are very well-trained and friendly. Also pretty much a hospital. Not my choice in an emergency, but great for general medicine. CLINICA NIÑO JESUS is one of the largest clinics in Santa Cruz. It has very good medical staff and technology. It offers ambulance service, surgeries, neonatal care, a pharmacy, and other services. It is rather expensive. Waiting times are long. CLINICAS PROSALUD are funded by aid from Germany, largely. Doctors are very good and facilities have good instruments and basic medical technology. They provide better care than most state operated hospitals. They stress making healthcare affordable to the general population and waiting times are generally quite long, but you can find several dozen of these clinics throughout Santa Cruz alone and there is usually one nearby to pretty much anywhere you are. PHARMACIES There are literally hundreds of pharmacies where prescription and over-the-counter medications can be purchased, but it’s best to use well-established pharmacies as their inventory turn-over rate is greater, and this helps to ensure you won’t be sold an expired medication. Also, they usually have a larger inventory of imported medications. You can tell which are the better, well-established pharmacies simply because most of them have several locations, and are large and modern. In Bolivia, most pharmacies are not open 24 hours and on Sundays, when nearly all business shuts down, you have to find a “farmacia de turno” (on-shift open pharmacy). Pharmacies, by law, take shifts on Sundays so that somewhere in the city, there are always several pharmacies open. The newspapers list which pharmacies are “de turno” each Sunday, their locations and phone numbers. If you are really too sick to go out and buy medicines, you can call a reputable taxi company and they will send a cab to a pharmacy to fill your prescription and deliver it to you. The following are the three best pharmacies, each with several locations throughout the city (listed are their main locations), most with some 24-hour service at at least one location, and several with drive-thrus. I’ve listed them in order of my personal preference, but they are all very good. LABORATORIES Labs are not hard to find. But good, very reliable, accurate labs are. Most hospitals and clinics will send you to outside labs for tests. The following are two good labs in Santa Cruz. They are well-organized and on time, I found, when you have an appointment. Results were also delivered always on time as promised. Personnel were friendly and equipment and lab areas were clean and sterile. DENTISTS Dentists abound. There are many, many of them. Not all are very hygienic or clean. There are good dentists in Santa Cruz, and most will do an adequate job, and the prices are usually very affordable. Clinica Dental Roca is one of the best dental clinics available. DOCTORS The following is a list of various types of doctors. They are well-known and some of the best in the city. You’ll find that many doctors have studied in the U.S. or Europe or elsewhere overseas. Most doctors work out of one or more hospitals. They have their own private offices, and use various hospitals depending on the patient's choice. Unless it is an emergency, the patient usually chooses which hospital he/she wants to be treated in and the doctor makes an agreement with the hospital to share charges. Most doctors have predetermined agreements with the hospitals and insurance companies already in place. Some insurance providers limit which hospitals can be used, but most of the time, the patient decides or takes the doctor's advice as to which facility to use. Drs. Balderas and Heredia provide good ultrasound services. They are on opposite sides of town. They are professional and friendly and really know what they are doing. Their equipment is good. Dr. Heredia has one of the only 3D ultrasound machines available in Santa Cruz. Dr. Ruth Turner is a wonderful person. She's American but was born and raised in Bolivia. She is one of the doctors authorized to do medical exams needed by the consulate. She brought my son into the world. She’s caring, and gentle, and volunteers her medical services every day at a mission. Drs. Chávez and Calcagno worked together when I had an accident to provide me the best help possible. They are friendly and attentive and really caring. Dr. Calcagno is from Uruguay and is a great plastic surgeon. Both volunteer their time with people who are missing limbs as well. Dr. Katimi is another very well-known plastic surgeon in Santa Cruz. Dr. Firestone and his wife are great. He is American and they are well-known in the American community. (Dr. Firestone was the pastor of the American community church for quite a while too). His wife provides family counseling. Super super nice. Dr. del Solar studied in the U.S. and speaks English fluently. He’s fantastic with kids. His office is well-equipped and he is always highly recommended. I think he’s the best pediatrician in Santa Cruz. He’s just great! Dr. Carlos Landivar Gil is a great ear, nose and throat doctor. He’s located right in the heart of Santa Cruz, just one block from the central plaza and is easily accessible. He’s very professional and friendly. VETERINARIANS OK, vets, what can I say? Most people just don’t give their animals and pets the importance they are given in some other countries and usually don’t take their animals to the vet unless they are sick or it’s an emergency. Most vets are ill-equipped for any major animal emergency and have few medications on hand. Many vets spend a large portion of their time providing pet grooming services more than animal medical services. I don't know of any animal hospitals, just small vets. I’ve never found a vet that I absolutely love so much I had to recommend him/her to everyone. I’ve mostly been disappointed by pretty much every single vet I’ve used so far (and I keep looking for a great one, so I’ve used quite a few). This is an adequate veterinarian, one of the better vets I’ve used. They were friendly and gentle with my dogs. Staff was nice, facilities are moderately clean. OPTICAS sell eyeglasses, contact lenses, medications, and eyecare supplies. 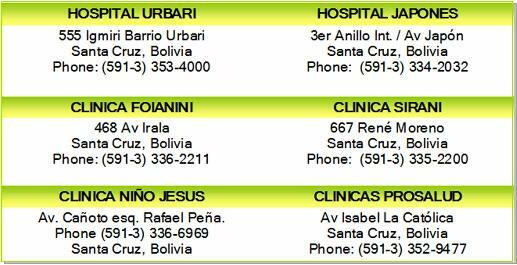 The U.S. Department of State provides a list (PDF File) of doctors in Bolivia on its website. It also provides additional information on healthcare in Bolivia at http://bolivia.usembassy.gov/medcare.html. The US Embassy also has a duty nurse who may be contacted through the consular agency.